The European Union brokered the deal that triggered the end of the Yanukovich regime. With Russia angry and the United States absent, it must now lead the rescue of Ukraine’s bankrupt economy – and first decide when to act, and how. The situation in Kiev is dire. Foreign reserves are melting away and the hryvnia, the Ukrainian currency, is in free fall in spite of a theoretical peg to the dollar. The economy is heading to a recession, with wide and widening budget and current account deficits. The public sector alone will need $13 billion to service its foreign debt this year, according to S&P. Russia already lent Ukraine $3 billion of the $15 billion promised to lure the former regime away from a deal with the EU. But the rest may not materialise, if Vladimir Putin doesn’t like the next government in Kiev. The EU cannot provide all the $20-odd billion that Ukraine would require to put the economy on a firmer footing. But it can provide political cover for a deal with the International Monetary Fund. A few months ago Kiev balked at the IMF aid programme’s conditions: the end of gas subsidies, a free-floating currency and a crack-down on corruption. This plan will have to be implemented at some point, but now is not the moment for foreign lenders to push measures that will hurt consumers and businesses. Talks about serious reforms require a legitimate government in Kiev. That will have to wait until after the May 25 elections. Can Ukraine teeter another three months? A decision on the currency cannot be delayed that long. The most reasonable option – dropping the peg – could lead to a disruptive instant devaluation of more than 30 percent. The EU and the IMF may have to provide an emergency bridge loan. And some form of debt restructuring looks unavoidable at a later stage. A bailout will only be worth it if it is framed in a broader political context. The EU must both state clearly that Ukraine can envision joining in the long run, and make sure that Russia stays involved. For years those two objectives seemed incompatible. The Maidan protests may have changed that. 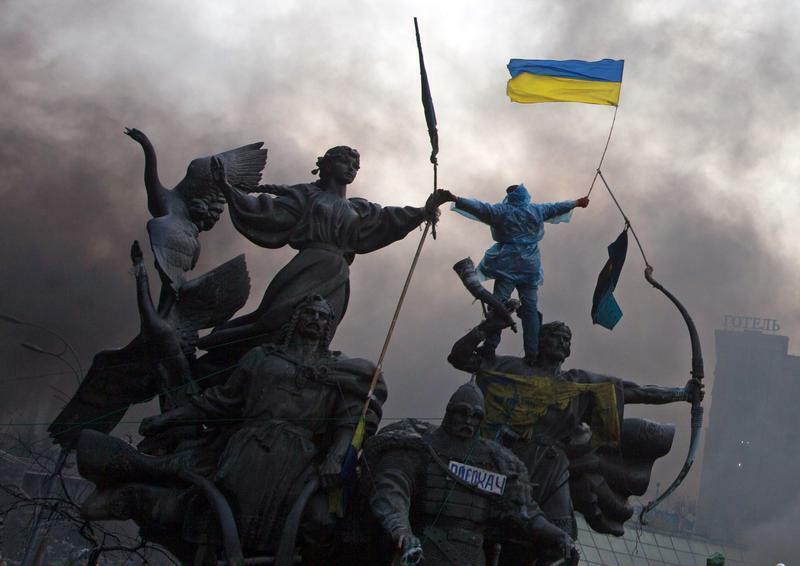 An anti-government protester waves the national flag from the top of a statue during clashes with riot police in the Independence Square in Kiev February 20, 2014. European Union foreign policy chief Catherine Ashton is travelling on Feb. 27 to Ukraine. She is expected to discuss measures to shore up the ailing economy, which the finance ministry said requires $35 billion in foreign aid over the next two years, with the first tranche needed within two weeks. About $13 billion of Ukraine’s $73 billion of external and domestic debt must be serviced this year. The country must redeem a $1 billion eurobond in early June, and the government has also guaranteed a $1.6 billion eurobond issued by state energy company Naftogaz, which falls due in September.